For years I've been using CD-R for backups, especially of photos. Every now and then I see an article about CD longevity (people are all over the map about how long these things are supposed to last; here's one useful article) and wonder if I should worry. A subsequent flurry of copying my older CD-Rs found read errors on many discs two and three years old. The two worst both had sticky labels on them. In one case (some images I didn't want to lose), I burned two copies of the same disc, printed a pretty label on one and marked the other with a Sharpie. The Sharpie disc read fine; the labelled disc had massive errors and was all but unreadable. The advice saying not to print labels for CDs meant for backup appears to be accurate; but even without labels, they're not reliable. I'm not sure of a better backup solution, though. I don't trust longevity for anything magnetic (I've seen too many tapes and floppies fail). One solution I'm trying is an IDE disk sitting in an external USB2/firewire enclosure: it can stay powered off most of the time, and copies are fast. But a disk has a lot of failure modes (magnetics, head crash, motor). Safer would be two external drives, kept in sync. # following line is sufficient. So I replaced the old libusbscanner script with the new one, commented out scsi, left /dev/usb/scanner0 commented out, and uncommented the standalone usb line. And voila, it worked! The old /etc/hotplug/usb/epson.scanner script (which I'd gotten from a SANE help page long ago) was no longer being called, since it's been replaced by libusbscanner. The main function of either of these scripts is to do a chown/chmod on the scanner device, so that non-root users can use it. An interesting variation on this is a bugzilla attachment which changes scanner ownership to the person who is currently logged in on the console. Might be worth doing on a multiuser system (not an issue for my own desktop). Installment one of Bev Harris and BlackBoxVoting.org's Freedom of Information Request: the Stinking Poll Tapes. Harris & company went to Volusia County, Florida to request the "poll tapes" from the election: the printed record that each machine produces at the end of the day, signed and dated by election workers. What they were given was unsigned printouts dated November 16, the day before their arrival. Apparent discrepancies between the original, signed, dated poll tapes and the supposed copies which the elections officials had originally tried to give them. This is all over the blogosphere, but doesn't appear to have hit much of the mainstream press so far, not even Wired, except for one early article in the East Volusia News-JournalOnline. But the story making the rounds claims Black Box Voting has it all on video. 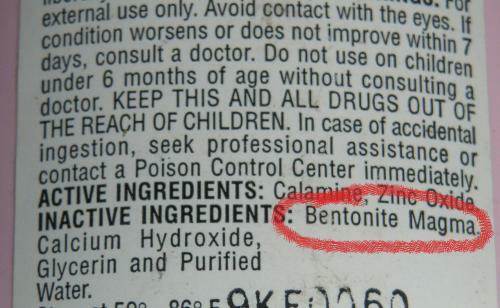 Reading the ingredients on a bottle of calamine lotion turned up something interesting. Funny, it didn't feel quite that hot going on! 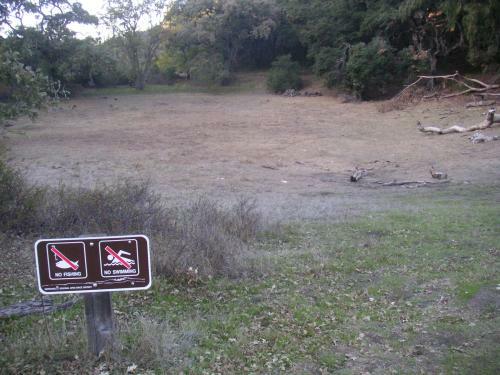 Unrelated to newts or poison oak is another humorous picture I took a while ago and have been meaning to upload: No Swimming. Fedora Core 3 is finally out, so I tried it this evening. The install itself went apparently smoothly, looking just like a normal Redhat graphical install, with a few new options, such as SElinux (which I turned off). The first problem came during the first boot of the newly installed system, when the boot process complained that fsck.ext3 was finding errors on hda2. hda2, on this disk, is a SuSE partition: I didn't tell the FC3 installer about it at all, so, correctly, it's not mentioned in /etc/fstab; and it's reiser, so FC3 has no business running fsck.ext3 on it! It dumped me into a single-user shell, in which mount shows / as mounted "rw,defaults", but any attempt to modify anything on the root partition complains "Read-only file system". I got around that with mount -o rw,remount / -- it turns out that typing "mount" doesn't actually give an accurate picture of mounted filesystems, and cat /proc/mounts is better. Now able to edit /etc/fstab, I noticed the "LABEL=/" and "LABEL=/boot" entries that Redhat is so fond of, and speculated that this is what was causing the problems. After all, there are several other OSes installed on this system (a Redhat 7.3 and a SuSE 9.1) and either or both of them might already have claimed the label "/". So I changed the fstab entries to /dev/hda6 and /dev/hda1. A reboot, and voila! things worked and I found myself in the first-time boot configuration process. I really wish Redhat would get over this passion for using disk partition labels, or at least detect when the labels it wants to use are already taken. Onward through hardware configuration. It didn't detect my LCD monitor, but that was easy to correct. It correctly detected and configured the sound card. It didn't try to configure a printer. At the end of hardware configuration, it took me to a graphical login screen (no option for non-graphical login was offered), and I logged in to a gnome desktop, with a rather pretty background and some nicely small and professional looking taskbars. The default gnome theme looks nice, and the font in the terminal app (gnome-terminal) is very readable on this 1280x1024 monitor. The default browser is Firefox, one of the 1.0 preview releases, with nice looking fonts. The first step was to try and configure a printer. Double-clicking on the "Computer" desktop icon offered only my two optical drives, the hard drive, and "Network". The Redhat menu in the panel, though, offered "System Settings->Printer", which ran printconf-gui, which revealed that FC3 had in fact autodetected my Epson Photo 700 and configured it. Strangely, printconf-gui's "Test" menu was greyed out, so I wasn't able to "print a test page" that way. I tried quitting printconf-gui, restarting it (still grey), left-clicking on the printer (still grey), right-clicking on the printer (nothing test-y in the context menu) -- and the Test menu finally ungreyed! The test page printed beautifully -- centered on the page, something Debian's CUPS setup has never managed. Clicking on the red ! in the taskbar took me to up2date; clicking through the screens ended up updating only the kernel, apparently because updates aren't auto-selected and I have to manually "Select all" in order to update anything. Once I figured this out, up2date, via yum, got started updating the other 75 available packages. But it only got halfway through before it hung (the window wouldn't repaint). It turned out that kill -1 on the up2date process didn't help, but kill -1 on the /usr/bin/python -u /usr/sbin/up2date made the window wake up and start updating again. I had to repeat this several times during the multi-hour update. Then it died, apparently with no memory of which systems it had already updated. Use yum -y update instead of up2date, because up2date doesn't seem to work right for anyone. So overall, FC3 gets a mixed review. The installer is pretty good. It's a bit light on feedback: for instance, not telling me that a printer was configured (or giving me an option to change it), which would have added a warm fuzzy since it turned out it handled it so well; or not giving me a non-graphical login option. The desktop look is clean and usable. OTOH, the boot totally failed due to the LABEL=/ problem, and up2date totally failed. A novice user, wiping out the disk, wouldn't see the partitioning problem, but if up2date is as flaky as it seems (everyone I talked to has had problems with it) it's hard to understand why they don't just use yum directly, and offer more mirror options (up2date only gave me a choice of one server, which was obviously overloaded). I biked down to the perc ponds today (the Los Gatos Creek Percolation Ponds, a part of the local water storage system where creek water percolates down through layers of sand, clay, and rock into the aquifer) to look for birds. Rumour had it that there was a female wood duck hiding out among the mallards. I'd never seen a wood duck, so I hoped to find her. Not only did I find her, but she has a boyfriend! Or, at least, there's a male wood duck in the perc ponds as well as a female, though they weren't hanging out together -- she was consorting with the mallards (and a curious ground squirrel) up by the trail, while he was out swimming in the pond. I also saw some gadwalls (a new duck for me) and got better pictures than I previously had (for my bird photo project of several birds, including a belted kingfisher (always a tough subject). Nifty! Today's pictures are here. Yesterday we went for a short hike at Alum Rock, and saw some more turkeys and even more deer, including a magnificent buck and a couple of little spike bucks, and lots of young deer play-butting each other. They've been added to the older Alum Rock turkey/deer photos from a few weeks ago. 93,000 Extra Votes In Cuyahoga County? Teed Rockwell, of the Philosophy Department, Sonoma State University, published a few days ago a sizzling article on ballot totals in Cuyahoga County, Ohio. Using the numbers from the county's official election results web site, he shows 29 different precincts which report vote counts well in excess of the total number of registered voters, for a grand total of 93,136 more votes than registered voters. For example, Highland Hills Village, which has 760 registered voters, had 8,822 ballots cast. One possible explanation comes in an AP story, Kerry campaign lawyers checking Ohio vote, which says that "the numbers also include absentee votes in congressional and legislative districts that overlap those cities", which wrongly inflates the numbers, and quotes Ohio elections board chairman Michael Vu as saying "All the numbers are correct. You have to first understand what an absentee precinct is." The story doesn't go on to explain what an absentee precinct is; it looks like absentee ballots are assigned to counties other than the county of registration, or possibly absentee voters aren't included in registration numbers at all. Meanwhile, a blog called "Political Strategy" reports on an editorial on the Zogby pollling web site, in Zogby Website Asserts 'Massive Voter Fraud'. I can't actually read the linked Zogby page (either they've pulled it, or they have some sort of bug in their server code) but in addition to calling attention to the fishy Cuyahoga results, they discuss the statistical unliklihood of some of the Florida results already showcased elsewhere. A final giggle: on the subject of why the exit polls were so wrong (I still haven't seen anyone quoting numbers! ), Craig Crawford of Congressional Quarterly and CBS suggested that the exit polls may have been wrong about Bush because of the "David Duke effect," an election in which he got many more votes than was reflected in what pollsters found because "people didn't want to admit to exit pollsters they'd voted for David Duke, the head of the Ku Klux Klan, because they didn't want to admit they were a racist. So perhaps a lot of voters didn't want to admit they voted for Bush." Last Sunday I mentioned seeing one newt remaining in the newt pond, and wondered whether the rest were migrating already. Today at Rancho San Antonio, we encountered a half-grown young newt, sitting on the trail nearly a mile uphill from the creek. After some photos (all but the first there are of this young 'un) we moved the newtlet off the trail where it wouldn't get stepped on. Later, Dave noticed a part of the trailside lurching repeatedly in and out. Obviously some small burrowing animal, perhaps a mole, was beneath the rain-loosened dirt, trying to decide whether to burst out into the open. We watched for a while as the animal tunnelled from one place to another, but every time we thought it might be getting ready to poke a nose out, another herd of hikers would come by and all burrowing would cease; time would pass, then dirt would begin to lurch somewhere else. We never did see the burrower. I've been hearing a lot of talk about how the official results don't match the exit poll numbers: how the exit polls show a Kerry win, and that's evidence of a hacked vote. For example, Those faulty exit polls were sabotage in The Hill, or A Tour of the 2004 Exit Poll: What It Says and What It Doesn't, part one and part two on Donkey Rising. What I haven't been able to find is anything with data to confirm this, one way or the other. CNN has an interactive page allowing checks of specific aspects of exit poll data, but that's no help for analyzing nationwide data, say, by county. And in any case, it seems that CNN changed the online data after the fact, so there's no telling what this means in terms of raw numbers. Lawrence Lessig gives the answer, in Free the Exit Poll Data: the poll numbers are privately held, not publically available. Lessig calls for the data to be made public, so that it will be possible to find out why the numbers were so misleading compared to the final election tally. You'd think both sides would be interested in knowing what went wrong. Maps and cartograms of the 2004 US presidential election results gives a wonderful set of maps showing "purple states" by county, with the sizes adjusted for population. Outrage in Ohio: Angry residents storm State House in response to massive voter suppression and corruption (Michigan Independant Media Center): Protests on November 3 in Ohio over all the voting problems the state experienced. Includes lots of anecdotes about voters who experienced problems. Surprising Pattern of Florida's Election Results (US Together): a comparison of party registration data to reported election results in Florida counties using different types of voting equipment. In counties using touchscreen machines, the percentage vote for Kerry matched the party registrations fairly closely; in counties using optical scan machines, there's a huge shift over to Bush votes, completely uncorrelated with party affiliation. The article includes a data table by county. Evidence Mounts That The Vote May Have Been Hacked (Common Dreams): a text discussion of the US Together results, their correlation with exit poll results, and some discussion of possible explanations other than foul play (and why those reasons are unlikely to be the actual explanation). Palm Beach County Logs 88,000 More Votes Than Voters (Washington Dispatch): Palm Beach County's official election results web site showed 542,835 ballots were cast for a presidential candidate while only 454,427 voters turned out for the election. Apparently they've since updated the web site to show numbers that add up. I guess this tells us how far we can trust the "official" numbers on the web site. Tons of other links on the Op Ed News: Votergate 2004 page. Bev Harris of Black Box Voting, Ralph Nader and others have teamed up for Help America Recount, a project to buy recounts in Ohio and other states. They're soliciting donations. I'd love to see recounts, but what they don't explain is where the money is going. What's involved in getting a recount, and does it cost money, or is this to pay salaries and expenses of the (volunteer?) people doing the counting, or what? The effort sounds like it might be a little disorganized at the moment. Kerry Won. . . (Tom Paine.common Sense): Editorial about irregularities in various states. No new data, though. Crikey 0.5 is out, with some changes contributed by Efraim Feinstein -- it can read from stdin now, and has a debug flag. Reading from stdin means you can generate multi-line text now. It's so cool when people send patches to my programs! Especially when they're nice clean code implementing useful features. Thanks, Efraim! We went for a "mander meander" up at Montebello this afternoon, curious how late in the season the California Newts hang around the newt pond. A month ago, the pond was full of newts, but today, only one was left. The rest must be migrating to wherever they go in winter. We didn't see any migrators. Interestingly, the poison oak disappears at the same time as the newts: a month ago the trail was full of poison oak, but today, nearly all of it was gone. Having nothing to do with newts, my fun project last night concerned an article in New Scientist about a new Hubble photo of a triple shadow transit on Jupiter. (They make it sound like a much more unusual event than it is; amateur astronomers get to see Jupiter double transits pretty much every year, and triple transits every few years, weather permitting, of course.) The article comments that the moons would look to an observer on Jupiter about the same as our moon looks to us, and that these eclipses as viewed from Jupiter would be similar to an earth eclipse. So a Callisto eclipse might be somewhat like an earth eclipse, with Callisto being one and a half the sun's apparent size, but the other moons appear much much larger than the sun. And Io is about the same apparent size in Jupiter's sky as our moon is here (about half a degree). An older style touchscreen machine made by Danaher Controls gave Bush 3,893 extra votes in suburban Columbus. In one North Carolina county, more than 4,500 votes were lost because officials believed a computer that stored ballots electronically could hold more data than it did. UniLect, the manufacturer of the touchscreen machines used, told officials that each storage unit could handle 10,500 votes, but the limit was actually 3,005 votes. The missing votes are gone forever; there is no way to retrieve them. In Broward County, FL (remember the missing absentee ballots?) it was discovered that a bug in an ES&S machine changed the outcome on at least one proposition. Seems that the software (for counting votes on absentee ballots) doesn't expect more than 32,000 votes in a precinct; so when the tally crosses that number, the machine starts counting backward! Meanwhile, the ACLU is suing over the lost Broward County absentee ballots. A national voting rights group has reported hundreds of voting irregularities in the south affecting poor and minority voters. Latest word (from Equal Vote) is that Ohio Secretary of State Ken Blackwell has said that Ohio's provisional votes will not be counted for 11 days (if at all). Black Box Voting has filed a massive Freedom of Information Act request for computer logs (including internal audit logs, transmission logs, and others), voting results slips, any email or other communication relating to problems with voting systems, and other information relating to the operation of electronic voting machines. Voters Unite has an excellent listing of stories on many other voting problems found so far. Printing's been broken on my Debian machine forever. For one brief shining moment back in July I briefly got it working, then a week later a dist-upgrade broke it again and it's been broken ever since. Last week Debian Weekly News mentioned a new package called "printconf" which supposedly autoconfigures usb and parallel printers for CUPS. Now, setting aside for the moment that there's already a package called printconf, which configures a completely different spooler than CUPS, and that it's very confusing of Debian to resurrect an old name for a completely different purpose, of course I wanted to try it. At apt-get time, it asked me whether I wanted to configure my printers now, and of course I said yes. The package installed, it printed a message about restarting CUPS, and no more details. Did it do anything? I visited the CUPS configuration url (CUPS is configured via a web browser) and the entry looked like my old printer entry. Just for ducks I clicked "print a test page". Nada. So I removed the entry, went back to my root shell and typed printconf. It printed "Restarting cups ... done." No other info. Back to the web configuration page ... no printer there. Eventually I discovered the -v option, which at least told me that it wasn't finding any parallel printers. I know this printer can be detected via the parallel port (SuSE and Mandrake both autoconfigure it), so something was wrong. Time to look at the BIOS. A bunch of reboots later, I finally managed to get into my machine's BIOS screen (hint: repeatedly press DEL during boot. The screen saying DEL is the right key only flashes for a fraction of a second, so there's no hope of ever reading it and I wasted several boot cycles pressing function keys instead) and changed the parallel port from "ECP" to "ECP/EPP". Back into Debian -- and voila! printconf saw the printer, autoconfigured it with some magic the earlier entry hadn't had, and after a year and a half I have a debian printer again! All hail printconf! I wonder if it's ever occurred to anyone to mention in the man page that it needs an EPP (or ECP/EPP?) parallel port? A few days ago, we took a break from Election madness and went for a late afternoon bike ride at Alum Rock. We were hoping for tarantulas, but had no luck on that count. But what we did find, at dusk as we rode past park headquarters, was wild turkeys! Dozens of wild turkeys, all random-walking and gobbling like mad, the males displaying their tail feathers. The handful of deer (a few fawns and several bucks with antlers sprouting) grazing nearby were nervous of the turkeys, and backed off when they came near. We stood and watched for quite a while, and neither turkeys nor deer seemed particularly worried about our presence. Alas, the light was low, so the photos didn't come out very well. I knew the Demo-wimps were going to fold, just like they did in 2000 -- but I didn't think they'd do it before the first vote count was even finished! I can't believe Kerry conceded already. What about all the promises the Democrats have been making us for the past several months about pushing lawsuits on voting technology and voter eligibility? What about all the lawsuits already filed? I guess nobody cares any more that there's no way to verify anyone's vote, that the voting technology of the country is entirely in the hands of one party. A show of democracy is all that's required; the actual votes, from actual citizens, are far less important than the pretense of voting. I should mention that Wired has had the best and most comprehensive coverage all along of the e-voting fiasco, beginning many months before any of the other mainstream media would mention the subject. Follow the links from that story, or just search for keywords like voting machines or Diebold. Or check out the original anti voting machine activist site: BlackBoxVoting.com and its sister site BlackBoxVoting.org. But Kerry and the DNC aren't fighting against any of that. They signed on until November 2, and now that's past and they can go back to having garden parties or whatever they do for three and a half years between conceding elections. As long as I'm collecting links to news stories, here are some about attempts to block voter registration or otherwise intimidate or discourage voters. States involved: Nevada, Florida, Oregon, Michigan, Ohio, and Iowa. Unfortunately the stories seldom say what type of touchscreen voting machine was being used. And keep in mind that changing only a single vote per voting machine in the 2000 election could have made a difference of 25 electoral votes, according to a recent ACM study (which unfortunately isn't readable online unless you're an ACM member). BoingBoing seems to be slashdotted (probably not by slashdot) but two other sites with excellent up-to-date news on election problems are E-Voting Experts, covering reports of problems with touchscreen and optical scan voting machines, and Equal Vote, covering some of the legal challenges against voters, in states such as Ohio and (of course) Florida. I'm happy to report that voting with paper in my neighborhood was surprisingly low hassle. The registrar did not ask me whether I wanted paper, but when I saw her circle "E" I hastily told her "I want a paper ballot". She looked momentarily surprised, but recovered quickly, scribbled over the "E" and marked "P". They didn't offer a pen, but I had brought one so I didn't ask. Then came the wait. They had four or five touchscreen machines, but only one booth (made from a cardboard box) for paper voters, already occupied. The ballot is long (in fact, there are two paper ballots, each 2-sided) so it takes quite a while to finish it. That was fine, because it gave me a chance to hear that they began asking the people registering behind me whether they wanted paper or electronic. They often had to explain the difference to voters who had no idea what the options were, which didn't sound easy; they were very patient about helping people understand the options and didn't try to brush anyone off. Roughly half of the people there chose paper. Voting was straightforward except that the booth's ledge was very low (for wheelchair access; the voter ahead of me was in a wheelchair). I probably should have grabbed a chair. While I was marking my paper ballot, I heard a woman who was having a lot of trouble getting the touchscreen machine to work. The pollworker worked with her for quite a while. I think they eventually straightened it out; it sounded like maybe she had to press really hard to get it to register her votes. When I had finished, my ballot went straight into a box, no provisional envelopes or anything like that. Paper voters get a different sticker, not the new "I voted, touchscreen" sticker (so I don't get to draw a circle-slash with a Sharpie like I'd planned). Reports I hear from other Santa Clara county voters: most have been asked "electronic or paper?" and I haven't heard any reports of provisional envelopes or other weirdness. Many who voted paper report people voting outside booths; in one case no booth was available, and paper voters sat at a folding table. There wasn't much privacy on the machines either, though: they don't have much of a wing to hide the screen from onlookers, so if you wanted to snoop on someone's votes, it's not difficult. All in all, I was pleased with how easy it was to vote with paper, with the competence of the poll workers, and with how many people chose the paper option. BoingBoing (the esteemed Cory Doctorow) already has coverage of some of the problems people are encountering trying to vote here in Santa Clara County (California) this morning. Like the Vote Save Error #9. Use the Backup Voting Procedure." message one voter got when trying to use the touchscreens. But about that backup voting procedure: it seems that even if you can persuade them to give you a paper ballot (bring your own pen, even though the Voter Information Guide specifically says on page 164 that after signing in at the polls the voter "receives a paper ballot along with an approved marking device"), the ballots cast on paper are being put in "provisional" envelopes, yet without the identifying information on the envelope which is used to approve provisional ballots. One really wonders if such votes will be counted. I wonder if it will be possible to get statistics after the fact for the total number of paper ballots counted in each precinct (and how many of them were provisional)? For comparison, I wish someone was doing exit polls to get an idea of what percentage of people are requesting paper ballots. Meanwhile, Kelly Martin reports that in Cook County, Ill. voting is no longer by secret ballot. Each ballot has a number on it which is correlated with the voter's name. One of the boingboing comments points out that voting problems should be reported to voteproblem.org. The EFF suggests using the Election Incident Reporting System.